Image caption When Abdeslam blew himself up in the Comptoir Voltaire cafe 15 people were injured, one severely. Disturbing video of an Islamic State militant blowing himself up on the night of the Paris attacks in November has been broadcast in France. 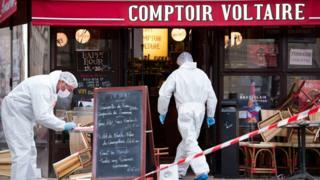 The CCTV footage shows Brahim Abdesalam detonating his suicide belt in the Comptoir Voltaire cafe. It has drawn shocked comments on social media but no formal complaint to France's broadcast regulator. Documentary maker Christian Huleu said it was important to show the reality of the militants' violence. He defended the use of the images, which are the most graphic of the attacks yet seen on French television. The video was part of a 90-minute film broadcast on Sunday evening on Zone Interdite (Forbidden Zone) , a current affairs programme on the independent channel M6. M6 did not say how it obtained the footage. There was widespread outrage in the aftermath of the attacks when it was reported that the Daily Mail had bought CCTV from another cafe for 50,000 euros (£39,000; $56,000). The M6 documentary - which went out at 21:00 and carried a strapline warning of its explicit content - used eyewitness interviews as well as amateur and surveillance video to give a detailed chronological account of the November 13 killings. Brahim Abdeslam was the elder brother of Salah Abdeslam, the only surviving attacker. Salah is now in jail in Belgium. In the video, Brahim is seen inside the Comptoir Voltaire, wearing a black coat. He begins moving among the tables, where people are seated in twos and threes enjoying Friday evening drinks. As he advances, he bows his head slightly and puts his left hand over his face. The next frame shows the explosion and the top half of his body being projected forward. In the next frame he is gone. The faces of the people present in the cafe have been blurred in the video. Several of them were injured but no-one died at the Comptoir Voltaire. Elsewhere on that evening 130 people were killed. Two million people saw the programme and afterwards social media buzzed with reaction. Some people said they had been too horrified to keep watching. Image caption This Twitter user was "shocked by the media who broadcast scenes of horror again and again for ratings". But in an interview with the Journal du Dimanche newspaper, Christophe Huleu said, "In order to make people see the true extent of the violence, you have to show it. "I had to find a balance between the violence of what happened and the respect due to both the victims and the TV viewers." Huleu said he and his team had watched footage from inside the Bataclan theatre - scene of the bloodiest attack - but it was too graphic to be usable. "I wish I had never seen it," he said. He also said he had been struck by the different public reaction that followed the Brussels attacks last month. He said: "In Brussels a feeling of inevitability appeared to have replaced the feeling of horror. But we must never give way to feeling it is inevitable. We must never let the violence seem normal." Debate continues to rage in France and elsewhere over the advisability of broadcasting shock images of terrorist attacks. Critics say it serves the purpose of the terrorists, who crave as much media attention as they can get. Bruce Hoffmann, who wrote the influential study Inside Terrorism, said that the terrorists' aim was not just to kill "but to create power where there is none, through the publicity generated by their violence".